Decks are usually made of wood, composite wood, or vinyl. The interesting part here is that irrespective of the material, deck building is entirely different from patios. Decks are set off the ground. They have supportive elements that actually keep them floating. And since the supports are customized to meet your terrain’s requirements, they can be short or tall. In other words, they make excellent outdoor structures for uneven landscapes. They often incorporate stairs that lead to the yard and since they are off ground, there is need for deck railing systems too. Decks are set attached or detached to the house but can also be installed in balconies and roofs. The sides and top are open although you can pair a deck with a matching wood pergola. The patio is set on the ground. It’s not floating. It touches the soil and so the terrain must be even. The common materials used for the construction of patios include concrete, stone, tiles, pavers etc. They are still detached or attached to the house and although open on all sides, they might still be matched with outdoor structures, like wooden pergolas. You can order custom decks to meet your landscape’s needs and personal aesthetics but you should know that the cost is higher than patios. Of course, it depends on the material the deck builders use but as an overall, patios are cheaper than decks. On the other hand, they bring a better return on investment. Although patios made of beautiful stones or pavers can be breathtaking, they don’t begin to compare with the elegance of a cedar or ipe outdoor decking. And so the value of the house goes way up with decks while the ROI from patios is very low. Your cedar custom decks will give you a beautiful view of the surrounding area whereas patios are flat and don’t offer a panoramic view. Decks need maintenance but this is also subject to the material you use. There is no wonder why many people opt for composite decking these days which might cost more than real wood but hardly needs maintenance. Patios are easy to maintain but are prone to cracking in case of extreme temperatures or improper installation. Which one should you choose? 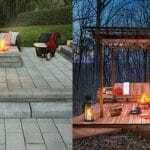 A deck or a patio? You need to consider the above differences and the pros and cons. You must also consider the pros and cons between vinyl, wood, and composite decks as well as the differences between patio materials. What will also influence your decision is your landscape. If the terrain is not even, deck is a much better option. Not that you cannot level the ground to install a patio but it will cost you much higher than anticipated. And then, it’s a matter of personal taste. 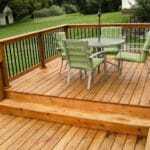 If you like the warmth feeling wood decks bring to the environment then a deck is what you should go for.